In the 1930s, the Portsmouth Navy Yard in New Hampshire built less than two submarines a year, yet in 1944 it completed an astonishing 32 submarines, and over the course of the war produced 37 per cent of all U.S. submarines. This book analyzes the factors behind the small yard s record-setting production, including streamlined operations, innovative management practices, the Navy s commitment to … develop the yard s resources as an alternative to private industry, and the yard s ability to adapt quickly to a decentralized wartime shipbuilding environment.The author highlights similarities between Portsmouth s efforts to accelerate production and those of private shipyards. He concludes that private shipyards deviated little from construction plans, while at Portsmouth a continuing dialogue with the Navy resulted in design changes dictated by feedback from the frontlines.Established on 12 June 1800 during the administration of President John Adams, the Portsmouth Naval Shipyard is the oldest continuously operating shipyard in the United States Navy. 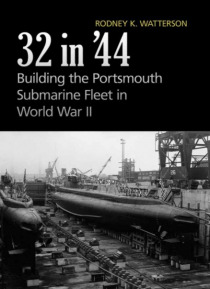 32 in '44, analyzes the factors behind the yard's record setting submarine production that made such a significant contribution to the winning of the war.